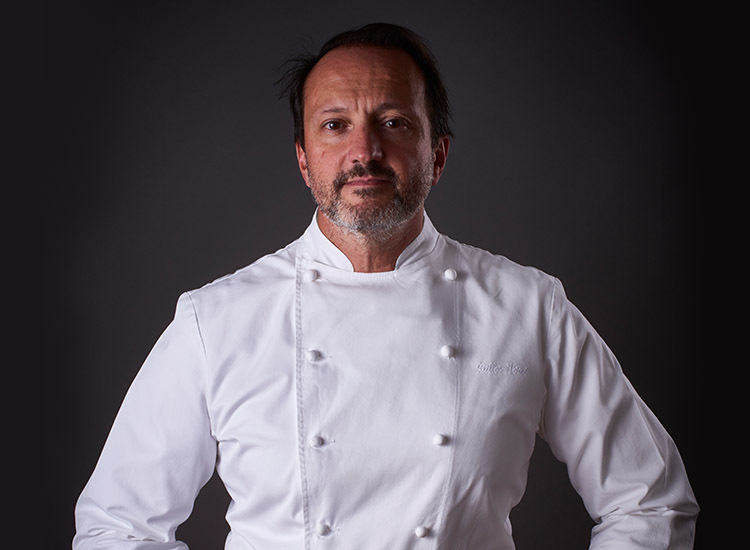 Girandole is pleased to announce a very special collaboration with renowned charcuterie maker, Gilles Vérot, this April. Gilles Vérot is the owner of Maison Vérot, which is known to serve the best charcuterie in Paris and has received many awards. Their most famous products include the pâté en croûte, the pâté grand-mère, jambon de Paris and their signature pie, la tourte Maison Vérot. Since 1930, charcuterie has been a family business for Vérot and his father was even awarded the prestigious title of Meilleur Ouvrier de France in 1976. He and his wife Catherine opened their first shop in 1997 and now own four shops in Paris. They have been carrying on the family legacy in producing the finest charcuterie and catching the attention of many influential chefs around the world. Michelin-starred chef, Philippe Legendre of Georges V, introduced Maison Vérot products to the Palace and celebrity chef, Daniel Boulud and the Vérots have together opened Bar Boulud, a wine bar honoring artisan charcuterie, in both New York and London. Experience authentic charcuterie by the master, Gilles Vérot, and indulge in his award-winning creations at Park Hyatt Tokyo’s French brasserie. Time:	Dinner (Daily) 5:00 p.m. to 9:30 p.m.
*Prices are subject to tax and service charge.